FatFs module: the file system is implemented with the FAT_FileSystem component. Low level disk I/O: this performs read/write operations on the bus to the memory. 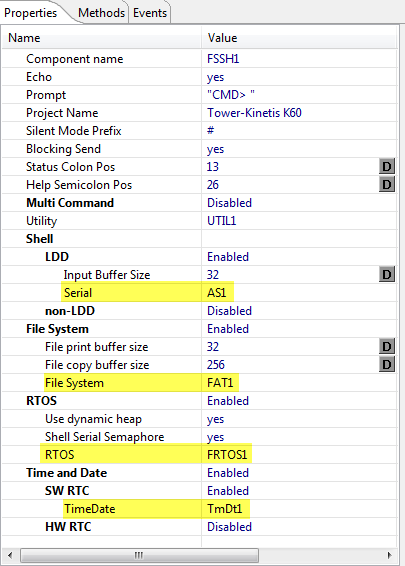 For non-Kinetis this is implemented with the SD_Card component plus HW or SW SPI drivers; for Kinetis this is the FatFsMemSDHC component plus a SDHC_LDD driver. 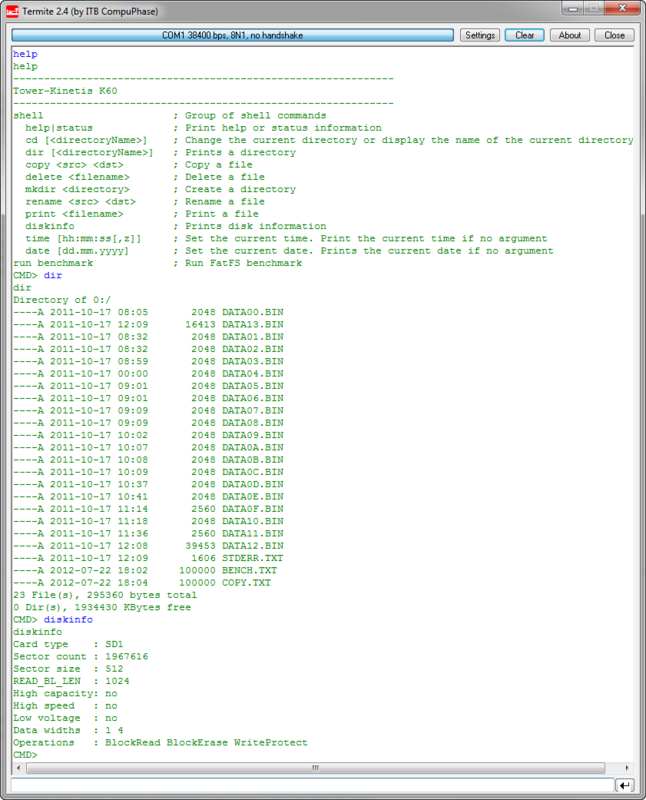 RTC: A Real Time Clock for time/date information, if files are written or changed on the disk. Here the GenericTimeDate component is used (see “There is a Time and Date for both Worlds”). To verify my port, I have created an application with FatFs, FreeRTOS and a serial shell application. 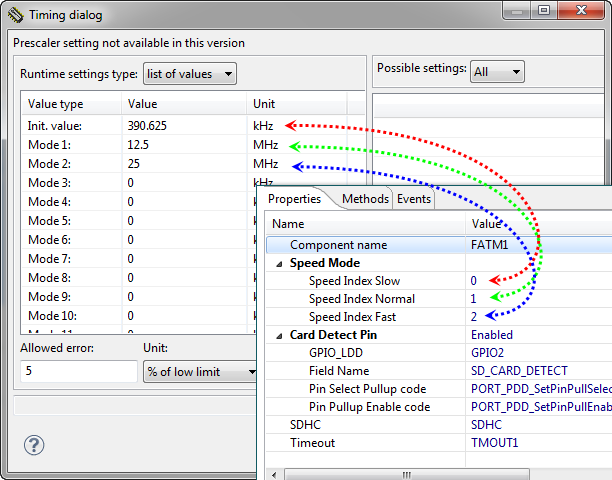 For debugging, CodeWarrior and the P&E Multilink Fx provide fast debugging and turnaround cycles. 💡 Alternatively a ‘shared’ interrupt event can be used, e.g. 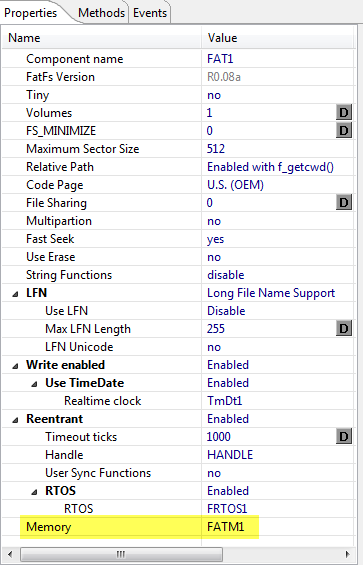 the TickTimer of an RTOS. The component supports three Speed Mode: ‘slow‘ (max 400 kHz SPI clock) for card initialization, ‘normal‘ for normal operations after initialization (up to about 12 MHz SPI) and a ‘fast‘ speed for high-speed cards if supported by the card. The numbers are index values inthe the SDHC_LDD speed table (more about this below). 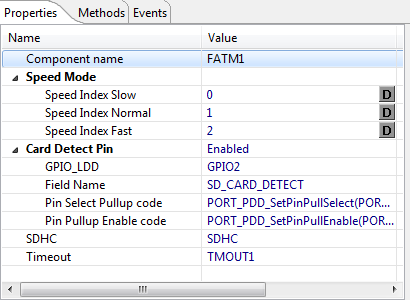 An optional Card Detect Pin: This references a GPIO_LDD component and field name. Additionally code for pin pullup select and pullup enable is provided. Links to the SDHC and Timeout components complete the system interfaces. 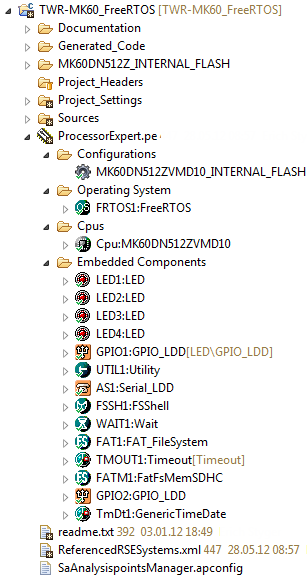 The Processor Expert components discussed is available from here. The example project sources are available here or with this direct link. This entry was posted in Boards, CDE, CodeWarrior, Embedded, Embedded Components, FatFs, FreeRTOS, Kinetis, Processor Expert, TWR-K60N512 and tagged Embedded Component, FatFs, FreeRTOS, Processor Expert by Erich Styger. Bookmark the permalink. I think that the problem was I passed to the sd writing function more than 512bytes. After this correction, I have made about 20 tests and only an image has been corrupted. I decided to increase the writing size of data to compensate the writing low speed. Anyway to write about 2,5M Byte of images on SD card it’s necessary to wait about 33 minutes. Please note that I have to reduce the SD clock because, writing 512 bytes at standard speed every time, some images were corrupted. I’m writing you because I’ve got a problem about my embedded project where I used Freescale K60 microcontroller an a micro SD card. The firmware reads imagas from SD card and I haven’t got any problem until I have change the micro SD card (I passed from Sandisk 4GB class 4 to Sandisk 8GB class 10) because the first SD card is now out of production. 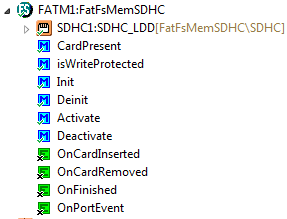 Using the new SD card, sometimes it stops working, the microcontroller cannot read images. I have a MOSFET mounted on the electronic board to drive the SD card power supply, so when the problem emerges, the firmware turns the SD card OFF for 2 seconds and disables the K60 module to communicate with the SD card. Then the K60 turns SD card ON again using the MOSFET and initilizes the module to communicate with the SD card. 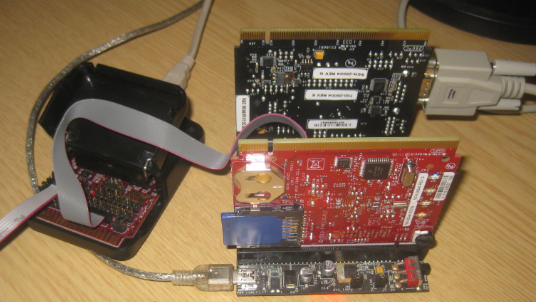 The software code to enable/disable the K60 SD card module was generated by processor expert. 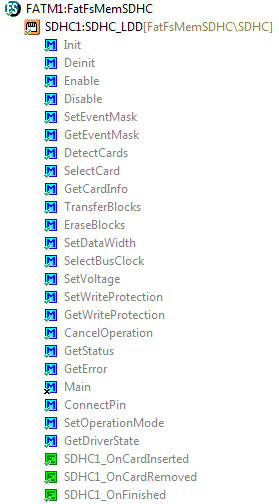 All this is not enought to wake up the SD card. If I reset the software emulator and restarts it again, the SD card starts working. Other solution is to open the SD card case and close it agin and SD card starts working. Unfortunately my software developed to wake up the SD card automatically doesn’t work correctly, but I don’t know why. Have you got any advise to help me? it sounds like you are using consumer SD cards. I would not use these cards for any serious projects. I use industrial SD cards (e.g. from https://swissbit.com/). It could be that your card draws too much current? I had this issue in some designs and I had to spend a better power supply source. What is your ‘software emulator’? 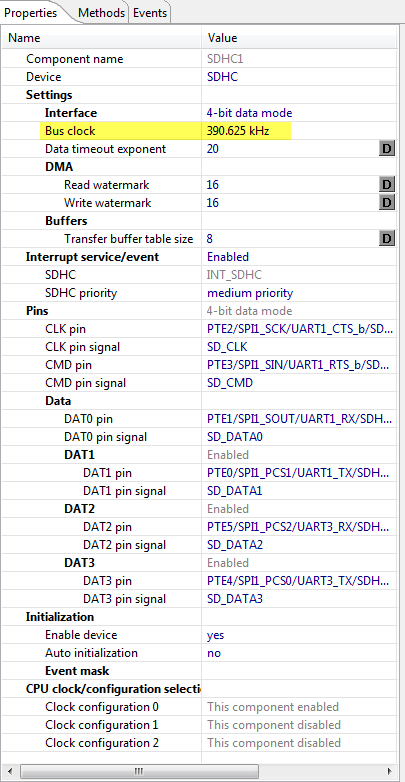 Do you have other devices on the SPI bus? The other thing is that you might still power the card with MISO/MOSI pins high: make sure they are pulled low. 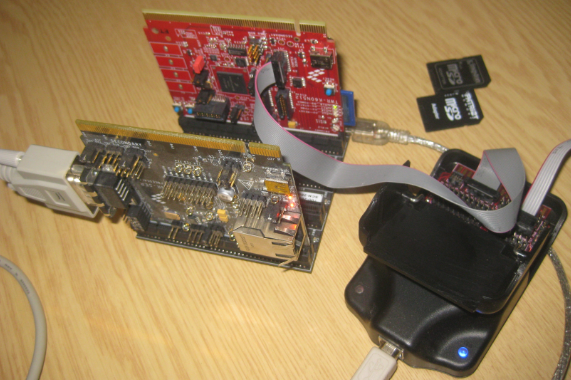 I don’t use SPI to cimmunucate with micro SD card, but I’m using the K60 microcontroller peripheral module. The sd card that I’m using is an industrial type. When it stops working, the error I can see is “disk error” and I cannot solve the error. Have you got any idea how to solve the sd card error? P.S: my software debugger is the Lautherbach trace and I’m developing software by CodeWarrior IDE. not sure what you mean with ‘peripheral module’. The SDHC one? I’m affraid that you have to set a breakpoint where that error occurs. Are you using my version of FafFS or something different?